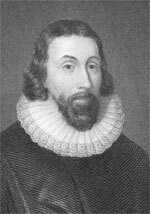 John Winthrop was born in Groton, England. While en route to the New World on board the Arabella in 1630, he wrote a sermon entitled "A Model of Christian Charity," in which he outlined the purposes of God for New England. Winthrop had a deep understanding of God's divine purposes for the colony. "We shall be a city set on a hill," he said of Boston - where the church was the center of life during those early years of the city's history. He described a harmonious Christian community whose laws and government would logically proceed from a godly and purposeful arrangement. John Winthrop also believed that this new form of government would help bring about a "Golden Age" and that one day all the nations of the world would copy this form of government: "We shall find that the God of Israel shall be among us, when ten of us shall be able to resist a thousand of our enemies; when He shall make us a praise and glory that men shall say of succeeding plantations, 'the Lord make it like that of New England.'" But Winthrop also gave a warning: "The eyes of all people are upon us, so that if we deal falsely with our God in this work we have undertaken, and so cause us to withdraw His present help from us, we shall be made a story and a byword through the world." Winthrop set out clearly the revealed purposes of God and warned that the success or failure of their endeavors would depend on their dedication to the ideal of selfless community. History shows us that this ideal was never realized, however, Winthrop laid the foundation for generations yet to come.